Overland Park, just like most of the cities in the state of Kansas, has 54 confirmed species of spiders. Research is ongoing about the remaining species, and scientists are close to confirming each of them. Spiders seen in this city are never bound by any territorial line as defined by humans. The number of spiders found here does vary from time to time, depending on the prevailing environmental condition at that time. The multitude of spider species found here indicates that a qualitative ecological condition does prevail in the city and its environs. While many of the spiders are found in households, many of them are only limited to the wild. Some of the common spiders in Overland Park are dangerous, but the spider bite is not as deadly as that of a bee sting, especially if you are allergic. Also, very few spider bites are recorded annually. Despite the infrequency, it is still important to know about the poisonous spiders in kansas and how to avoid them so that you can guide against a possible spider bite. This spider is unique in its anatomy. For example, it has six eyes, whereas other spiders have eight eyes. The six eyes are arranged in pairs, with two pairs located laterally and the last pair occupying a medial position. Only a few species of spiders have a similar eye arrangement like the brown recluse spider. Many other spiders have colorations patterns on their ventral and dorsal abdomens, but such cannot be said of the brown recluse spider on either its legs or abdomen. Also, there is no spine on its legs. Additionally, the abdomen of the spider is covered with short hairs that look like soft fur when viewed with the naked eyes. You may find a slight coloration on the leg joints, however. Their lifespan is usually two years, and the female tends to produce several eggs during its fertile period, which can last for up to three months; that is, usually from May to July. Each sac of the egg can contain up to 50 eggs, and these eggs require about one month to hatch. After hatching, the spiderlings produced will become adults after about a year. The spider is highly resilient; it can live under extreme drought condition and live without food for up to six months. In fact, research has shown that they can last for up to 5 seasons without food; this is one of the factors that make them highly virulent. Furthermore, it spreads its legs radially when standing on a flat surface. It, however, lowers its body when it is alarmed and prepare for a bite in defense. It also arranges its legs into a defensive position when cornered by withdrawing the front legs rearward in a straightforward manner. In this position, it can lunge forward for a quick bite or attack against the offender. The spider bites the offender using its pedipalp, which is a prominent and horizontally held forward for an easy bite. The brown spider does not always bite its offenders when attacked. In fact, it prefers to avoid conflict than to put up a fight. It also prefers to turn around and avoid contact with you when detained. There are also times it prefers to play dead by assuming a lifeless pose. It will only jump when you touch it brusquely. 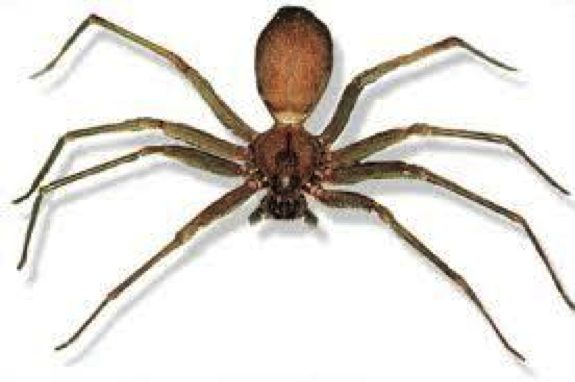 Unlike several other spiders in Kansas, the brown recluse spider does not leave any silk line behind it when fleeing. Consequently, it is not easy to track by its pursuers. Additionally, the brown recluse spider is known for building asymmetric webs. Their webs are usually built undisturbed and dry locations, like cellars, plenum spaces, garages, closets, sheds, and woodpiles. They prefer to build their webs in cardboards when they reside in human residences. Its venom is lethal no doubt, and it attacks the nervous system very fast. It can cause death if the victim is not given the anti-venom timely enough. If you want more information about the brown recluse read a more in-depth article here. The black widow spider is the other poisonous spider found in Overland Park, Kansas. Its color varies from shiny black to dark brown, especially when it is fully grown. Also, the spider displays an orange or red hourglass shape on its ventral surface; that is, its underside. Some forms of the spider feature a pair of red spots and some other forms have no marking. You can find red and white or only red marking on the dorsal surface of the male form; the marking can be in the form of spots, bars or stripe. There is equally a similarity between the appearance of the male and the juvenile form. On the other hand, the female may either feature a paler brown color or no marking at all. The black widow spider displays what is called sexual cannibalism, in which the female consumes the male after mating; this is why it is called the black widow spider. Research shows that the sexual cannibalism contributes to the development of the juvenile. Be that as it may, not all female forms of the spider show this behavior. Sexual cannibalism fails to occur if the female has already eaten before mating with the male. Even some male black widow spiders take their time first to find out if the female has eaten before they mate with such a female black widow spider so that it will not prey on them after mating. The black widow spider produces highly potent venom. The toxic compound in the venom has also been traced to some of the common spiders found in households. The female produces a large amount of this venom that can kill their insect-preys and harm humans. The venom contains a powerful neurotoxin called latrotoxins, the most toxic of which is called the alpha-latrotoxin, which can attack the nervous system of the victim just minutes after a bite from the spider. The above are the poisonous spiders found in Overland Park, Kansas. However, these spiders are not as common compared to other common spiders in the area, and the occurrence of a bite from any of them is rare. Even when such occurs, clinics administer anti-venom for immediate resolution of the associated pains and prevention of the attendant neurologic symptoms. Every spider bite must be treated with emergency since you may not be able to identify immediately if any of the two mentioned above has bitten you. Why not take a picture of the spider to show your doctor, who can determine if it is any of the poisonous ones or not? This way, the doctor can administer the right anti-venom. Don’t worry about the bite prevent it. Our spider control services in Overland Park has a protection guarantee and will get rid of spiders and many other common pests in the area. Please fill out the form below or call us to get protected today. ← Who’s Responsible for Pest Control in a Rented Apartment – Landlord or Tenant?